My youngest and eldest daughters have quite a close relationship. This week I managed to snap them playing the new Mario and Sonic at the Rio Olympics game on the Nintendo 3DS. We are lucky to be part of the Nintendo UK Family Blogger Network, and on Friday, we were given a chance to try out the new Mario and Sonic at the Rio Olympics game on the Nintendo 3DS. 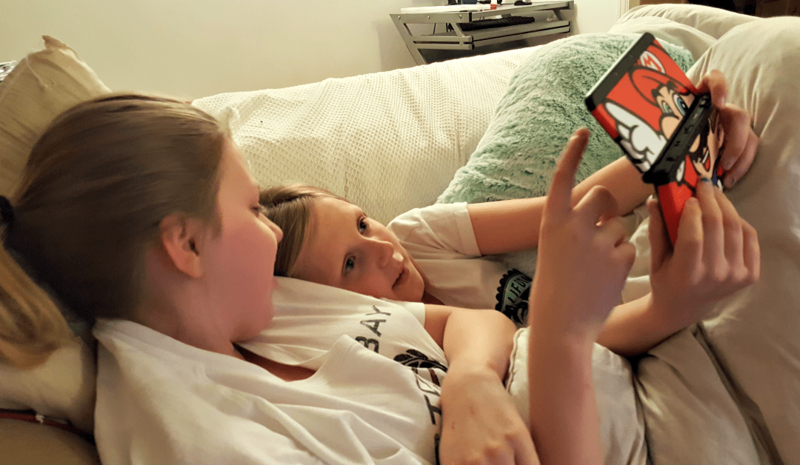 I thought that Chance, my 9-year-old would monopolise using the game, but the girls soon grabbed the 3DS and had a go themselves. I snapped this as they were sat on the sofa, engrossed in the game and wrapped up in an old duvet. That’s a lovely photo of your girls together. Aw how lovely! Nothing beats spending family time together even if it’s just playing games together. I had to take a look at this – happy siblings?! It’s such a wonderful (and rare) sight. My kids seem to argue more the older they get. There is now only one good relationship – my younger son and my daughter. My eldest doesn’t get on with either of them at the moment, which is exhausting! I must admit that my middle daughter seems to be the same as your eldest in that she’s not getting on with anyone else, sibling-wise. And yes, it really is exhausting, isn’t! Always good to see siblings getting on together – funny when it’s over a single personal console. I know my brother and I used to fight all the time (physically mostly, and winding up competitively) and my mum was always concerned that we’d never speak to each other as adults. But we’re living around 2 miles apart and see each other lots (helped by being the only ones in our family left after our mum died. As an only child, you have no idea how nice this is to read! I always worry that my kids will all hate each other when they are older given how much they argue now. What a wonderful photo! It’s so nice to see them get along. Great photo! Ah I bet there was some lovely quiet time there. Such a lovely picture, I love playing my 3ds with my little brothers. Mario games are so fun! Haha this is how my son bonds as well. I so dont know how to play so my son is giving me lessons!